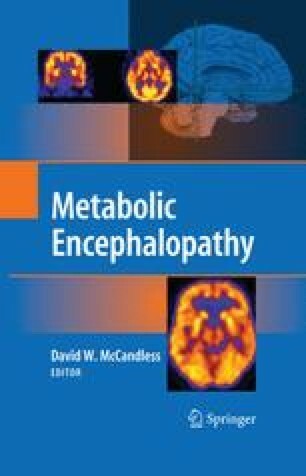 Thiamine (vitamin B1) deficiency (TD) is a unique example of a nutritional deficit that produces a generalized impairment in oxidative metabolism and leads to metabolic encephalopathy or delirium, memory deficits and selective neuronal death in particular brain regions. Experimental TD is a classical model of a nutritional deficit associated with a generalized impairment of oxidative metabolism and selective cell loss in the brain. The response to TD is altered by the genetic background (i.e., strain) and the age of the animal. Changes in thiamine-dependent processes have also been implicated in ischemia (stroke), diabetes and multiple neurodegenerative disorders. An understanding of the mechanism by which TD leads to brain dysfunction and eventually to selective neuronal death is likely to facilitate our understanding of the role of thiamine in all these disorders. In addition, the results are likely to help our understanding of the fundamental mechanisms leading to altered neuronal functions and neuronal death in these other disorders.